Check out LinkedIn’s new Share Button. What’s new? Today we are excited to announce the launch of the new LinkedIn share button. Now, with just a few lines of code, publishers, bloggers, and businesses can easily include a button on their site that lets readers and visitors “Share on LinkedIn”. In the past, publishers like The Huffington Post have integrated LinkedIn share on their website. 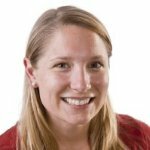 Starting today, sites like Bloomberg, Forbes, and the Mercury News' SiliconValley.com are doing the same. In addition, they are also integrating even more advanced functionality like the ability to sign-in to your site with LinkedIn credentials, which you can learn more about here. We know there are a lot of options for sharing content today, whether it’s on Twitter or Facebook. And, now with our new LinkedIn’s share button, we’d like to offer readers an effective way to share relevant professional content - news, thought pieces, white papers, or presentations on slideshare – with their business network on LinkedIn. As a professional, we know the importance of staying up-to-speed on industry trends and business news and now we have made it easier for you to share that news and research with your team, clients, and peers from your favorite business news sites. Or, use LinkedIn share to get a conversation started with clients and colleagues you haven’t reached out to in a while. We’d love to know what you think about the new share button. Also, feel free to click share on the LI share icon at the top of this blog post and share this post with your LinkedIn network. Ed. 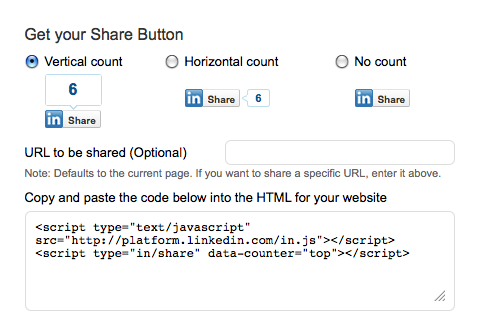 As many of you have asked about it, here's how you can add LinkedIn Share to your Wordpress blogs. Check it out.